In Pennsylvania, 16,050 distracted driving crashes resulted in 69 fatalities during 2016, with the state courts reporting a 52 percent increase in citations for distracted driving last year. That’s why the House Transportation Committee is continuing to look into the issue with a public hearing this week on two current proposals. House Bill 1684 would prohibit operating a motor vehicle while making or taking calls on a hand-held mobile phone, except with the use of a hands-free accessory. The bill would further prohibit a driver under age 18 from operating a motor vehicle while using any hand-held mobile phone, including a hands-free accessory. House Bill 892 would create an additional summary offense for distracted driving if a driver is also found to be driving carelessly. The fine for distracted driving would be $50. A wide variety of behaviors are considered distracted driving, including using an electronic device, grooming device, food and drink, and printed material. More information about distracted driving is available here. April is also recognized as National Distracted Driving Month, a good time to put down the phone and other distractions, and practice safer driving. 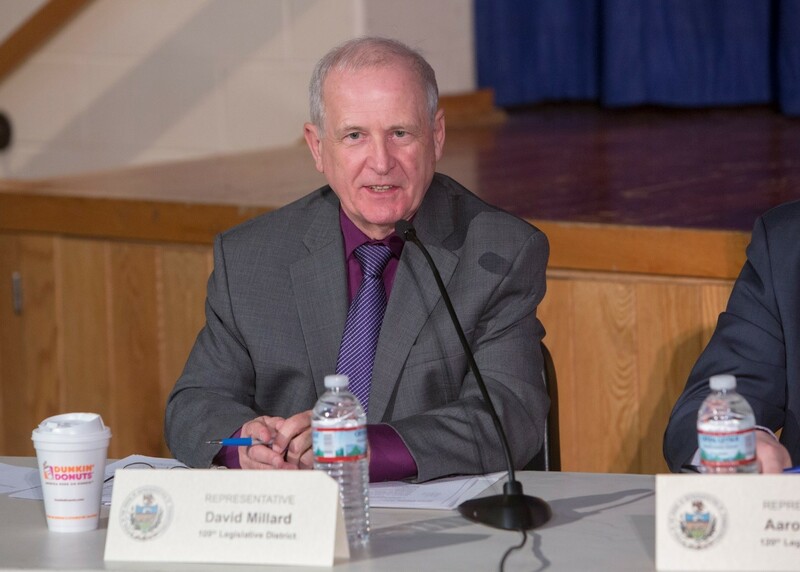 I was grateful for the opportunity to participate in Thursday’s House Majority Policy Committee at Elk Lake School District and the Susquehanna Career and Technical School on the issue of rural broadband access. We heard a lot of testimony regarding how the absence of high-speed internet access is holding back local economies, and we heard an update on the long-range plans of providers and discussed emerging technologies that could help solve the problem. We heard from the following organizations: Central Bradford Progress Authority, Soil Services, Endless Mountains Health Systems Inc., Wayne County Board of Commissioners, Broadband Cable Association of Pennsylvania, Verizon and Microsoft. I’m hopeful we can take this conversation and work toward meaningful legislation or other partnerships that can bring more affordable and quality broadband to rural areas like ours. Should Local Police Be Allowed to Use Radar? The issue of allowing municipal police to use radar to detect vehicle speeds on local roadways was discussed during a hearing of the House Transportation Committee this week. Under current Pennsylvania law, only the state police can use radar to track vehicle speed. House Bill 2148 would change that by creating a six-year pilot program so accredited municipal and regional police could use radar as a speed timing device. Under the bill, radar would be used only by full-time police officers and only after an approved course of training and refresher course every three years. The legislation includes several provisions to prevent potential abuse and provide for a defense against prosecution if it can be demonstrated that radar use is generating 1 percent or more of the municipality’s total revenue. Supporters of the bill believe it could help reduce speed-related crashes, while opponents have concerns about overzealous use of the devices to raise money for municipalities. According to the state police, speed was cited as a factor in 31,083 crashes in 2016. Now that spring has arrived, the nicer weather will allow Pennsylvanians more opportunities to explore our state’s 121 beautiful state parks, operated by the Department of Conservation and Natural Resources (DCNR). Pennsylvania’s state parks system manages 300,000 acres for popular recreation activities, such as hiking, picnicking, camping, fishing, hunting and boating. Pennsylvania state parks do not charge an entrance fee; however, fees do apply for some activities. If you like to enjoy the outdoors with your dog, 56 of our state parks offer dog-friendly campgrounds. Click here to learn more or to find a park nearby. Visitors can make reservations online here or by calling 888-PA-PARKS (888-727-2757), 7 a.m. to 5 p.m., Monday through Saturday. • Gary Bennett-Elk of the Year. • Grace Jaskiewicz-Officer of the Year. The Pennsylvania Historical and Museum Commission recently approved 16 new state historical markers. The new markers, selected from 51 applications, will be added to the nearly 2,300 familiar blue-with-gold-lettering signs along roads and streets throughout the state. Click here for the list of newly approved state historical markers with the name of the marker, location and a brief description. Nominations for markers can be submitted by an individual or organization and are evaluated by a panel of independent experts from throughout the state and approved by the agency’s commissioners. For more information, including application information, visit www.PAHistoricalMarkers.com. 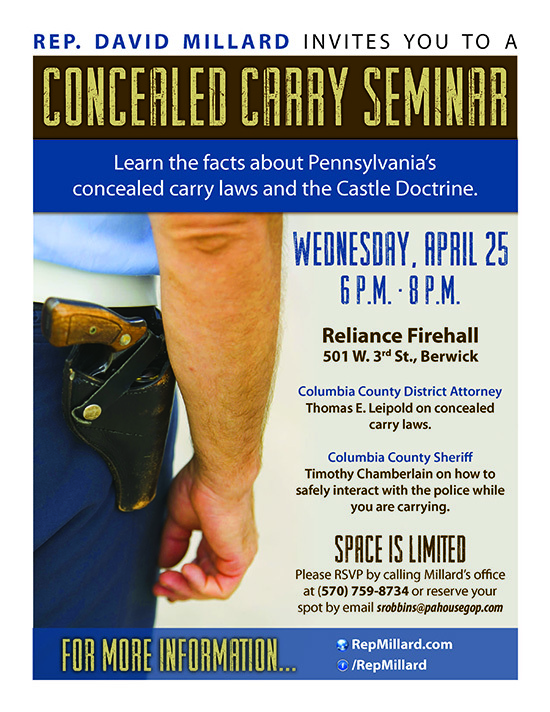 Join me for a Concealed Carry Seminar on Wednesday, April 25, at Reliance Fire Hall, located at 501 W. 3rd St., Berwick, from 6-8 p.m. Columbia County District Attorney Thomas Leipold and Columbia County Sheriff Timothy Chamberlain will share information about Pennsylvania’s concealed carry laws, as well as how to safely interact with the police while carrying a firearm. Seating is limited and registration is required. Please RSVP by calling my office at 570-759-8734 or email srobbins@pahousegop.com. Spring is finally upon us and work zones are popping up across the state. With the start of construction season, motorists are urged to use caution when approaching a work zone for the protection of the highway workers and the motorists themselves. • Drive the posted work zone speed limit. • Stay alert and pay close attention to signs and flaggers. • Turn on your headlights if signs instruct you to do so. • Maintain a safe distance from other vehicles and do not tailgate. • Use four-way flashers when stopped or traveling slowly. • Avoid distractions and give your full attention to the road. • Our Senior Caregivers Forum will be held at the Northern Columbia Community Center in Benton on Tuesday, April 24, from 10 a.m. to noon. Registration is required. Call 570-759-8734 to register.